In the second of our experiments in search of the Essential Busk Page, On Stage Lighting sets a new set of restrictions that give us a chance to explore further techniques used in busking concert lighting systems using pro level consoles. 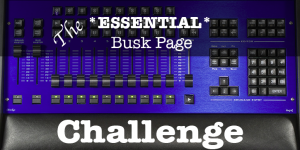 If you’ve been following along with this part of the question for the Essential Busk Page, you’ll remember that we are working with a set of rules that give us 24 palettes. No playback, executors or anything else. The introduction to this including the details of the rules are below this update. The issue with our Palettes Only setup is that palettes are really designed to call up LTP attributes. Pro lighting desks may have dedicated Intensity palettes but these are outside of our rules. This means we have two options. To use standard methods for calling Intensity in the programmer. This includes @FULL or @0 or using the Intensity wheel having grabbed a group of fixtures. The first option is possible but does rather use up vital palettes and causes potential mess during playback. However, we can retain the option to put some Intensity data into another palette. Remember that we also have a Programmer Master which will act on anything in the programmer. Given that we have no other playbacks, this will be everything that is lit on stage, making it a Grand Master that excludes any key light, haze etc. We could move back along the scale towards the Too Complex end by PARKing fixtures at a level which would then hold them there until we UNPARKed them. This risks ending in an operating mess during the show. In a more realistic show condition, we could solve the intensity problem by applying the intensity levels in the Preset window rather than the Programmer. This is similar to having hardware channel faders on the desk and being able to leave them up, unaffected by CLEAR or BLIND. This seems slightly outside of the Programmer only scope of the rules, but the option is worth bringing up. Let’s start with the premise that we’ll only control intensity in the programmer, usually by selecting a group or groups and fading them up or down using the Intensity wheel. Groups are an important part of programming anyway, but are vital for selecting fixtures when busking in the programmer. The Group is used to select a handful of fixtures prior to assigning a palette that changes the attribute, the whole action using only a few button presses. We only have six groups available to us so need to make them effective. The best approach in this case is to create an All group of each fixture type: All Spot, All Wash, All LEDs, All Media. We can use a desk’s inbuilt Odd, Even selection modifier to split these groups down still further during playback and create two colour looks etc. However, there are only a few Spots and Washes and the Media and LEDs won’t benefit a great deal from this. It’s an option, though. Perhaps split the PARs into a Warm and a Cold Group and then refine them still further down to a single colour using Odd/Even. The key thing with Group selection is that we must be able to select more than one groups at once, meaning we can turn all Spots and Washes blue at the same time. Most desks have Mulitple Group Select as some kind of option. Only six colour palettes, so we need to choose wisely. The colours will be available to be applied to LEDs as well as Spots and Washes. We might also want to assign something to the Pixmap media fixture too, to give us options. I haven’t given up the idea of assigning Intensity values for the PARs in the colour palettes completely but the concept is currently on hold. The main thing with Colour is to make sure each palette has all the data in it to properly set all colour parameters in the fixtures, not just add certain wheels and mess up the final colour. With the Pixmap, we could put data into the colour palettes that sets a suitable colour to a media file that plays. Remember that we’ll control the overall Opacity of the Master Layer separately but still need to open up the clip Layer, play the clip etc. That will probably be the work of Beam palettes. We’ll set the colour here. In moving light and media server control, the Beam attribute family takes a battering. Everything that is not Intensity, part of the colour or positioning system often gets shoved into Beam. Particularly with complex Spot fixtures, this can be a lot of additional functions all under the one roof. Any show file can easily have way more Beam palettes than others but we still only have 6 available. I always want to be able to strobe stuff, many acts benefit from a good strobing. However, the minimum conventional Strobe palette setup would use up two palettes: Strobe On and Strobe Off. Not even different speeds, just a decent speed and on and off. The reason for the Off is that when you fire an LTP attribute palette in the way we plan to run this show, only a new command on that channel will stop it. We need Strobe Off too. To save Beam palette’s we’ll elect to put the Strobe Off in with the Open Beam palette, which we also need to clear gobos etc. This means that in order to clear the Strobe, we’ll also have to fire Open Beam. However, this isn’t a huge hardship as we regularly use Strobe on an open beam anyway to maximise impact. So, the moment for strobe arrives, we have selected the fixtures and hit Strove On. When it’s time to stop, we hit Open/Strobe Off and the beams clear and stop strobing. I can live with that. That leaves us four Beams. Let’s say we want at least two to be gobos, with all the focus taken are of. One decent beam splitter and other of your choice. This gives us Open, Splitter, Gobo 2 along with our Strobe. In a larger busk setup we’d have Gobo Rotates and Prisms, again with Rotates. With so few Beam palettes, all that is a luxury so we need to be picky. For my money, Prism Rotates have more impact. We also would like some control over the speed. This needs at least one slow and one medium Prism Rotate, using up two palettes. The No Prism will again be taken care of by the Open palette, which also contains data to clear the Prism. Gobo 2, or a Tight Iris Down. We may be able to replicate some of these palettes for the Pixmap or LEDs, such as the Strobe or Rotates. However, not all the attributes that control this live natively in Beam, so we might need to force a few in. Imagine that you’d like to select all the MLs AND the LEDs and hit Strobe ON all at once and have them all do it. As the LEDs are patched as straight RGB units, this won’t be easy and in that case we might consider using adding a ‘strobe’ intensity or video clip to the Pixmap here. Just something that effects a Strobe on the LED wall and matches in with the MLs. Ideally, we’d not have to remember to select the Pixmap rather than the LEDs for this strobe but needs must. There is the option to force an Open White into the Strobe ON palette for the MLs, giving us full White Strobe effect instantly. However, we can’t make Strobe OFF return to our previous colour in this experiment’s setup. There is a limitation to the Prism operation here in that we can start a Prism Rotate from a non-prism state but it will only Rotate and you can’t leave the Prism in and stop the rotation, only clear it out. This Prism stop is common effect in shows but perhaps if we set the Slow Rotate to be slow enough, we can use it for a similar slowdown at least. The Pixmap’s native position attributes relate to the 3D positioning of a clip which doesn’t really help much with busking this show. However, we can force non-native attributes in, and for the LEDS too. The issue is how to name them and which of the six positions they would live with. We’ll need to think further about that but it seems like an ideal way to play out a handful of video clips on the LED wall using the Pixmap fixture. The clips would be textural and chosen to work with a range of colour overlays using the Colour palettes applied to the Pixmap and the LEDs themselves. Because the Pixmap and LEDs are treated as different fixtures with their own Intensity and colour, there is scope here for a range of looks based on a few clips. This is particularly true if we included some Zoom control at the Beam palettes, creating a ‘new’ looking clip simply by zooming into an old one. That an using flat LED colour, odd/even colour and colour FX on the FX page (yet to be considered) we have quite a range of possibilities from a very few buttons. So far, we’ve sorted out six Groups, Colours, Beam and Position palettes and given thought to Intensity control. This leaves us with a lot of scope for busking all kinds of acts already but we have yet to really add any dynamics in the form of chases or continuous movement. This is where out six FX palettes come in. In the next and final update for the Palettes only experiment we’ll look at how we might divvy up the FX palettes and close out this busk setup by giving some thought to how to make some tweaks within the rules to really make this a viable busking page. See you at the next update which will be sent out to the free Guest List very soon. If you aren’t already a member, add you email in the box below and I’ll send you the final up as soon as it’s ready. If you joined me for the last experiment, you’ll remember that we were restricted to 10 fader playbacks only. The write-up goes into more detail about the outcome, but the starting point included a series of rules that excluded the use of Palettes for busking. In the real world, palettes became and continue to be, a popular method for firing attributes such as Colour, Beam and Position and building up a ‘look’ on stage. Concert Lighting Programming in 20 Minutes covered the practice of quickly building a few Intensity playbacks and getting together a series of palettes, all to be used together in creating a light show live on stage. Because palettes are used in lighting programming to make certain attributes active in the ‘programmer’ of a lighting desk, this method of busking is often referred to as ‘busking in the programmer’. The method is different to the use of playbacks as the programmer just contains information which is then overwritten or cleared as part of the show – the purpose of the programmer for building cues is largely ignored and instead the ‘bucket’ of data is just used to hold temporary colours, beam looks etc. Firing attributes live using palettes works well for colour, beam and position and, in modern consoles, FX such as shutter chases and movement. This method works less well for intensity, although it’s not impossible. For this experiment, I’m using the same Robe Demo Show available in the Demos folder in MagicQ PC. This show is a small rig with a couple of moving fixture types, generic PAR channels and an LED array upstage for playback of media and FX. It has a visualiser file already setup and is fairly typical rig for a small festival. If you are playing along with another desk, the setup is 4 Spots, 4 Washes, 4 Colours of PARs and a pixel-mapped LED array. Why set any rules? Not being able to a lot of stuff is hopefully going to lead to more critical thought about the requirements of the rig for a flexible but usable palette busk page. 6 palettes on Colour page. 6 palettes on Beam page. 6 palettes on FX page. Master and Flash/Sub Master are available, along with Crossfade fader. Keylight for the band and haze is assumed as a given and not included in the experiment. Operator must have proper control over the look on stage. No ‘insta-disco’ techniques where the whole look or show is ‘randomly’ generated. However, layered combinations and happy accidents are allowed. Further rules that are not yet considered can be added if they arise during the process. The purpose of the restrictions is to focus on lighting a show using a fairly simple but flexible palette-based busk system and in the process to consider the methods involved and potential for real-world applications. In the Playbacks Only experiment it was noted that when creating playbacks in practice, it is best practice to base a lot of the playback data on palettes. This is still the case but we won’t get too bogged down in nested palettes. Now we will be working with palettes right in our line of sight, it should be acknowledged that the restrictions of 6 palettes per window are to be available for playback – in reality, other palettes will usually exist already. We’ll just have 6 per attribute page available for running the show. During the Playbacks Only experiment, the issues with cue stacking for busking becomes apparent. With potential for a large number of cues per stack, you still only have ten playbacks, meaning that access to something buried in a twenty cue stack is not intuitive or immediate. With stack busking, limiting the number of cues per stack helps with this and so, in reality, you have limited access to a limited number of things. The higher your cue count, the less immediate or intuitive getting to any of those things becomes. With palettes, we benefit from ‘first level access’ to a lot more stuff for the outset. Each palette has a ‘button’ on screen and they are all laid out, all the time, ready for instant interaction along with our playbacks. Busking with palettes as attribute setting buttons allows for a more flat structure than with playbacks. The idea of not using any fader playbacks would seem a bit like choosing to drive a car having removed the front wheels. Fader playbacks are a core function of a lighting desk, however in the spirit of experimentation we are going to try to work around the lack of playbacks yet keep the busk file simple and usable. The No Playbacks rule is going to throw up a few problems, particularly when it comes to controlling HTP intensities and maintaining a grip on the stage look. The Robe Demo Show has generic PARs doing colour washes, kit with only HTP Intensity as a single attribute. One idea for dealing with these PARs in order to get them to take part in the ‘palette’ system which would move some of their control off playbacks and onto the palettes. The overall principle is to hack a group of PARs into an LTP fixture, with each PAR colour becoming an attribute. This would then mean that the ‘fixtures’ could be selected and colour palettes applied to it. Doing this would restrict the capability of two-colour PAR washes and actually take up a lot of time fiddling around with DMXs addresses and fixture profiles. The idea is too complex so I’m not going to take it further. However, there may be a simpler way to command PAR colours via palettes which we’ll look at next time. We could also create complexity by piling up different attributes on a single palettes button with the hope that we’d remember to select particular bits of that palettes to playback, not all of it. I don’t want to have to think about this during a show, it can lead to mistakes. We’ll create palettes that can generally be applied to a whole groups of fixtures with no regard to having to ‘mask’ (or leave out) things recorded into the palette. This means that, for example, a Position palette that doubles up as a gobo selector is probably to be avoided. We are going to have to put palettes for different fixture types into one slot, for example a Spot Gobo and a Wash Beam attribute. As the Spot and Wash don’t do the same thing, we’ll start to run into palette naming problems which might by confusing during the show. Especially as any Beam palette could potentially have a slightly different purpose for each fixture type: Spot, Wash, Media, LED, PARs. The solution is probably going to be to reduce scope to keep naming and playback of the palettes manageable. Positions will need to be whole looks of all fixture types rather than a series of building blocks that need specific selections to build a final stage picture. We are busking this show, no one has time for that level of messing about just to get stuff in the right place. There are a few ways to playback a show file that relies on the use of palettes to produce the looks on stage ‘live’. One of the basic workflows is to select a group of fixates and apply a palette to them, either while ‘in view’ of the audience or with the group’s Intensity master playback faded down. The second method allows a number of palettes to be applied before revealing the final output by fading the fixtures back in. When applying a single palette such as a colour or position with the fixtures already lit, it is common practice to bring the palette in over a specific fade time so that the change of colour or position doesn’t crash into place in a snap. This works well for fading attributes but isn’t always ideal for gobo wheels, fixed colour wheels or any DMX channel (s) that bumps through a series of unwanted things before it gets to the final destination. The technique for applying a palette over time is similar on many pro lighting desks and in the case of the MagicQ you just select the Group or fixtures, hit a number of seconds on the keypad and then press the palette. The new palette look then comes in over that number of seconds, in the case of a position it takes that time to arrive at the new position. You can also do some cool stuff like setting a wait/delay that spreads out along a set of fixtures. Doing this makes them all move or whatever in turn, resulting in an orderly wave into place. The downside of this method for changing the look on stage is that unless you are cunning with delay times and selections, the simplest version of this only changes one palette at a go. In reality, there are plenty of times during a show when you don’t mind this, maybe a big colour change and nothing else until a later position or the adding of an effect. If you want to apply a whole lot of palette-based changes, similar to an entire look or cue, then a common method is to use the BLIND key. BLIND on a lighting desk makes changes to fixtures without showing them on stage to the audience and this function was originally designed to allow for updating future cues without it causing havoc with what the audience sees. When in BLIND mode, anything ‘in the programmer’, including palettes, aren’t shown on stage at that moment. When exiting BLIND mode, any contents of the programmer such a palettes we’ve applied, are revealed. In the playback method that reveals a whole new look based on palettes in the programmer, the look is built in BLIND mode and then revealed over time – this causes all the changes and timings to start to happen at once. Busking a show with palettes usually uses both single palette changes and multiple reveals using BLIND and CLEAR, which involves CLEARing the programmer over a specified fade time. The results of this depend on desk settings and also any particular playbacks that are running ‘under’ the programmer – as a rule, the programmer has the highest priority of playback. Our problem is that with no playbacks or executors running, we risk having nothing to CLEAR to or having anything happening with we BLIND the programmer output. This is a real pain for smooth running and is likely result in a step-by-step style of show rather than large changes, simply because we are not really able to flip-flop between programmer and playback. There is no safety net and in this case the BLIND and CLEAR buttons become two more ways to accidentally hit DBO. If you accidentally hit CLEAR, UNDO will restore the programmer contents with a snap. On the MagicQ, it is possible to set up the Sub/Playback Master to be a Programmer Master for intensity. This would be even more useful if we had the option of also using playbacks but, assuming that our key light and haze were also under desk control, we can still avoid the Grand Master and leave the haze running while fading the rig out. We also have the option of running Intensity from the Presets rather than the Programmer. In the next update, we’ll look at the allocation of Groups and palettes on the Colour, Beam and Position page. We’ll also make a start thinking about the application of FX palettes. In the final update of this Playbacks Only exploration, we think through the pros and cons of what we have so far. 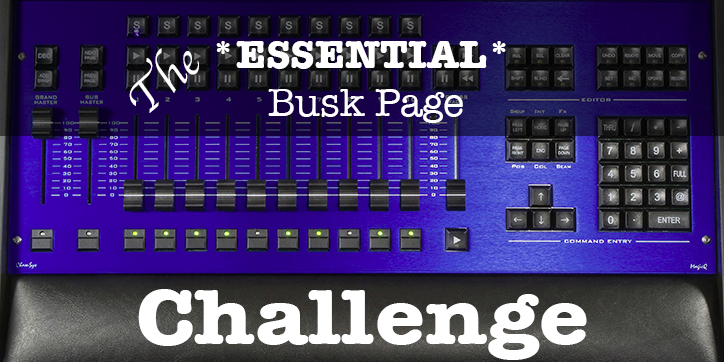 We also look at how the playbacks might be set up and the potential effectiveness of our Playback Only busk page. Put your email in the box and join us to get the full text update that includes the Final Update and a load of other goodness for FREE!